Situated on Dubai’s famous Jumeirah Beach and boasting 1200 metres of beach, Le Meridien Mina Seyahi is a luxury resort. It has several swimming pools, tennis courts and a gym. Le Meridien rooms have air conditioning and modern furnishings. They come equipped with TV and minibar. Some rooms include butler service and panoramic views of the Arabian Gulf. Leisure facilities at the Mina Seyahi feature a water sports centre. Younger guests can enjoy the Penguin Club which offers an activity programme, beach games as well as 2 separate kids’ pools. The hotel has many food and beverage options, offering a wide range of international cuisine. Moored in the marina there is a restaurant situated on a traditional Arabian boat that serves seafood. 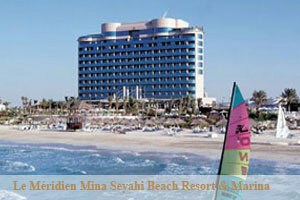 Le Meridien Mina Seyahi Beach Resort is opposite the Emirates Golf Course. The Dubai International Airport is less than 4 km away. An airport transfer service is available on request. Located on the beachfront only 20 minutes away from the city centre and opposite the world-famous Emirates Golf Club and Montgomery Golf Course, the hotel is a boutique-styled luxury resort with 211 guest rooms.. Most of the hotel's rooms have balconies with patio furniture and glorious sea views. Situated just 35 minutes from Dubai International Airport, this five-star resort is set on 1,200 meters of the Jumeirah coastline, lining Dubai's largest private white sand beach and glittering, 238-berth world-class marina.